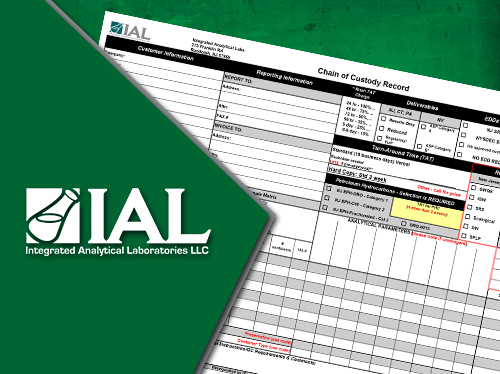 IAL continues to prepare and provide sampling guides and forms to aid our clients in the collection and documentation of air, soil, and water samples. These guides and forms are based on industry and regulatory requirements and are updated accordingly, as needed. For project sites in New Jersey, the NJDEP's Field Sampling Procedures Manual provides the methods and procedures for obtaining samples for chemical analysis. This manual, along with document updates, can be accessed by clicking here. Further technical assistance is available by contacting us directly. We have prepared a number of chain-of-custody (COC) forms based on state and/or regulatory drivers in the sample collection and documentation process. The TO-15 method is the required approach for obtaining a sample of air to evaluate volatile organic contaminants in homes, ambient air, and sub-surface locations. Our updated handbook on its application and use is now available.